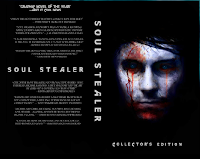 Soul Stealer: The Collector's Edition from Blackwatch comics is a trip through an eternal web of gods, monsters, deceit- and a love that breaks the bonds of time. This is a collected edition of the award winning Soul Stealer trilogy; which is a book that I never had the pleasure of reading the first time around. The story itself took almost a decade to complete and it's easy to see why as this is one of the most intricately told 'comics' that I've read in a long time. Oh, and the art style is absolutely phenomenal (and must've taken a really, really, long time to finish). 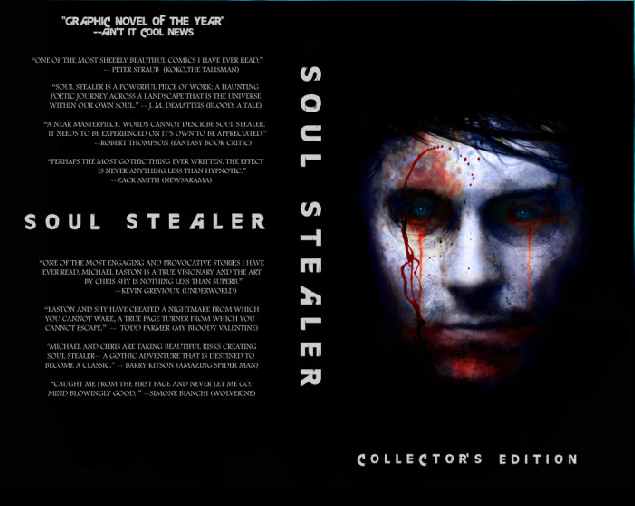 Written by Michael Easton (who's actually a soap opera star), Soul Stealer is not a happy or feel good tale. What it is is emotional, gripping, and extremely deep. I almost think that three books (which is what the Collector's Edition binds together, with more added in for good measure) wasn't enough to really get into the source material and explore the universe that Easton has crafted to it's fullest. And that's not a jab by the way- it's just that the back story is so cool that I wanted more of it. Always a good thing. Something you should be prepared for is that the story jumps around quite a bit at different times throughout. One moment we're in the present, another we're in the ancient past- and then somewhere else entirely. The flow of the story is more often than not terrific though and it never gets choppy or hard to follow, it's just something that's probably a good thing to be aware of going in. Shortly after we meet the main character, we jump back to a different age. At first I didn't know what was going on, but everything makes sense (trust me) if you just keep reading. That main character, by the way, is Kalan. And by all accounts, there's something very different about him. Massive scars cover his body, a strange jewel is embedded in his hand, and his mind is perpetually tortured and tormented by constant thoughts of a love lost. His wife Oxania is missing; as we find out, she's been missing for quite some time. The search for her eats most of the time away from Kalan's immortal existence. Although Easton starts things here in the modern world, as I mentioned above- it's not long before the first flashback of the book takes us back to another period. We find the story moved to ancient times as a horde of barbarians marches on the civilized nation of Etruria. Kalan is there, as is Oxania. The two are preparing for war with the invading army and the king of the barbarians, Apis Bull. More monster than man, Bull is massive both in size and in his capacity for brutality. I don't really like to go big with spoilers for reviews, so I won't do that here; but what I can tell you is that as Soul Stealer goes on, things get grayer and grayer. We constantly are pulled from the past to the present and characters twist back and forth with motivations that may have seemed evil one moment, only to suddenly switch to the opposite... or at least what might appear to be the opposite. There's a lot going on here, and that's probably putting it mildly. There are gods everywhere and nefarious forces and ancient relics abound. It's excellent stuff and it needs to be taken in slowly by the reader. Don't rush through this book! You'll be doing yourself a disservice and you will definitely miss out on some of the finer plot points. 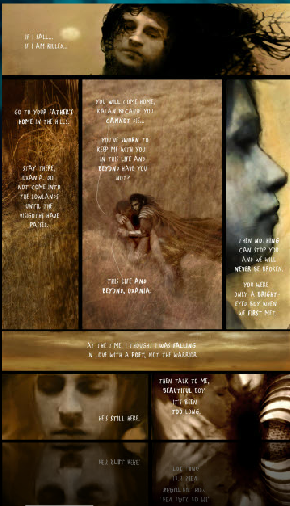 Part of why Soul Stealer is such a captivating read is the art of Christopher Shy. I'm not sure how best to describe it, but Shy's art looks like actual images of real people cut and fused with both pencil work and some kind of otherworldly dreamscape. It's moody, dark, emotional, and often violent. The style reminds me a little of the work Dave McKean did on the classic Batman graphic novel, Arkham Asylum. The difference being that where McKean was showing insanity in all it's colors, Shy is delivering raw emotion. 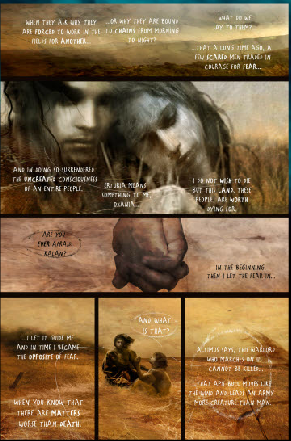 Anger, fear, loss, and finally love all come through with an intensity rarely seen in a graphic novel. Soul Stealer's visuals are well detailed too and lovers of the ancient world and mythology will find its pages filled with nods to various pantheons and old world cultures. There's a ton about this book that was so, so, cool. Just being honest here, but I didn't really expect to be as 'into it' as I was. Yes, it sounded pretty nest but I didn't know the level of book that it was until I started reading. Right from the first few pages, you can tell this is something special. 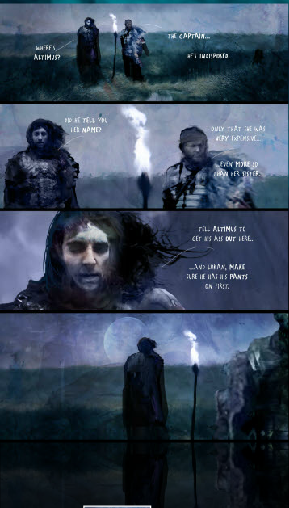 The art is gloriously gothic and the story is, in a word, epic. It is, at the core, a story of how love conquers all. An old saying but at the same time stunningly true. Soul Stealer is an excellent read that's well worth the time it takes to get through its five hundred plus pages. If I could have had it my way, it would have been even longer. *Also worth noting here, for those that already have the stand alone volumes, there's a bunch of exclusive stuff bound in the Collector's Edition. A cover gallery, special intro by the author, and never before seen 'directors cut' material are all included.